Asian-inspired design touched with European sophistication. 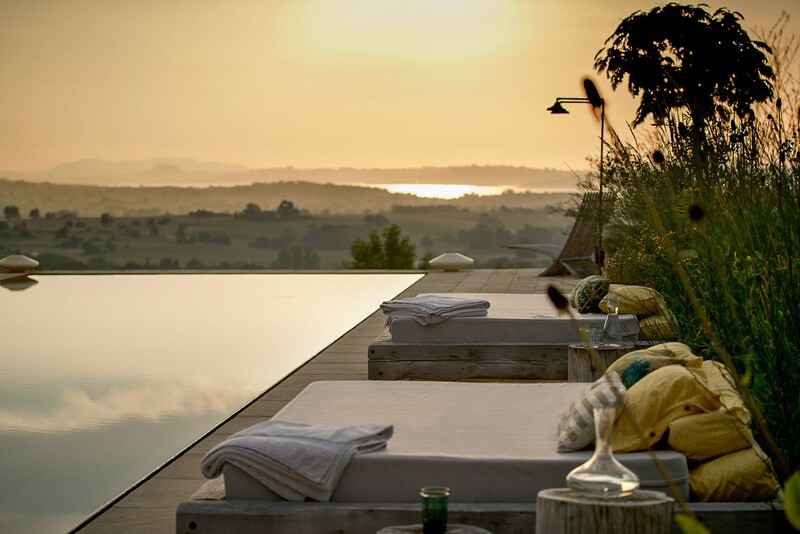 Sprawling over 25 scenic acres and blending traditional stone architecture with airy and modern interiors, Villa Bahia, with its 7 unique bedrooms, tennis court and private spa, represents the apex of luxury on the coast of Santander. Children adore quirky loft bed for a Pyjama party to end them all! Indoors, the villa’s interior design is equally inviting and yet decidedly different – a study in space and light with heavy Asian influences and chic European flair. This is sleek, designer modernity, and yet somehow also deferent to the estate’s old-world roots. This dichotomy of old and new is evident from the moment you enter the home: space and light bounce throughout the open, yet clearly defined areas. Wall-to-wall windows frame views of the pool, gardens, and a distant and glittering Santander. Spaces flow – entrance to kitchen, kitchen to dining, dining to stylish living room. The home’s décor is rustic-chic – a warm and cosy blend of traditional stone walls illuminated by flickering candles, high ceilings to scatter natural light, and wooden floors covered in sheepskin rugs. And everywhere, the view: the gardens, the hills, the bay, and those glittering city lights. The estate is perfectly presented for strolling and exploration, with two small lakes, fruit orchards, and cottage gardens, as well as country lanes that wend through the hamlet of Carriazo – typical and traditional Spain – and further into the village of Galizano. The villa also occupies one of the top culinary and wine destinations in Spain. It is convenient to north-coast towns in Asturias or Bilbao, home to the world-famous Guggenheim, as well as to San Sebastian and its promise of sushi and pinxos. This is a region that begs exploration once you have finished discovering the delights of Santander and the new Botin Centre, just 20 minutes away. Back at the villa, Santander and Villa Bahia are an outdoor dream: the air is fresh, the estate surrounded by mountains and cliffs that wrap white-sand beaches, and the sea a celebration of water sports, including surfing, sailing and kite surfing. There is no compare, no equal to Villa Bahia’s standard of luxury, anywhere in Northern Spain. Sprawling over 25 hectares (62 acres) of rolling countryside, twin lakes, manicured gardens, and spectacular panoramas, Villa Bahia is a charming and luxurious country estate – the most unique in Northern Spain – backed by the Cantabrian mountains and fronting views to the bay of Santander. An effortless blend of old and new, this welcoming villa stands as living testament to the classic stone architecture common to Northern Spain. And yet, Villa Bahia is also a modern, luxury estate that celebrates sophisticated décor, bespoke designer details, upscale amenities, and wide-open spaces that still manage to afford the utmost privacy. Step outdoors and this stately home reigns over green pastures, farmland, and two lakes – landscapes so beautiful, you could spend an entire holiday on this property and still never want to leave. And explore, you will, on country strolls around the estate and down rural lanes that wind by stone walls, quaint churches, grazing cows, flowering fields, and dramatic cliffs that hug wide, fine-sand beaches. This is rural Spain, as it has been for centuries. The stone manse of Villa Bahia extends over a main villa and annexe apartment, and stands watch over an optional separate two-bedroom guesthouse – the perfect distribution for families or generations exploring Cantabria together. 5 bedrooms in the main house and annexe, plus a 2-bedroom guest house, sleeping a maximum of 12 adults + 5 children. Villa Bahia is a fully staffed property with 2 housekeepers visiting daily. Duties include preparing and serving a cold breakfast, general cleaning, helping tidy dishes, make beds, operate Spa facilities, lay tables, serve drinks by the pool, etc. Personal laundry and cooking light meals can be requested and paid for directly in resort. At Villa Bahia there is also a dedicated villa manager who can assist with extra services such pre-arrival shopping, wine orders, chefs, transfers, masseurs, nannies, etc. This villa is within easy reach of a whole range of experiences to add to your travel memories. From adrenaline-fuelled water-sports to gourmet delights, vineyard visits to fine art galleries, we work closely with the best local suppliers to help make your stay extra special. In addition, Villa Bahia has a boat available with a skipper that can be requested by guests for day trips for up to 8 people. Advance reservations are preferred where possible, particularly in high season. If you would like us to pre-stock the fridge with a selection of food and wine, please do send your requirements with 7 days notice. If you fancy a night off, why not book one of the villa’s talented local chefs to come and fire up the BBQ or create a special menu to showcase the best of the Cantabrian cuisine. Please ask us for details and prices. The house has a wine list available to pre-order a selection of hand-picked wines from the owner’s cellar. To help you get the very best from your stay at this villa, your Concierge will be happy to assist with transfers, car hire, chauffeurs or shuttles during your stay. The main villa’s primary living area offers vaulted ceilings, herringbone oak floors, and plush cream sofas that ring an open fireplace, with quirky antiques, Asian details, pops of colour, and tropical plantings to breathe energy into the space. A balcony rings the upper floor and extends the view. The second living area seats 8-10 and offers plenty of books and games for family evenings in, or Tibetan Singing bowls for quiet relaxation. In the Guest House there are two living spaces: a TV room with leather Chesterfield sofa and dual-aspect windows that overlook the countryside and city; a second living space joins the kitchen-dining-living room and open fire. The main dining area offers a quirky refractory-style table with bench seating – the perfect spot for a family meal and conversation. There is also a round breakfast table with seating for 6 in the kitchen space; this opens through French doors to the poolside. The main kitchen is a chef’s dream, with expansive worktops, central island, a Lacanche range oven, and vintage features, including a citrus press. In the guest house, a second complete kitchen is well outfitted with stone worktops and premium appliances. The main living room offers a complete home cinema system with board games. Downstairs, a Gentleman’s Lounge offers leather Chesterfields, open fireplace, private bodega, and full bar with fully-stocked soft drinks fridge. The entire villa is wired with Bose and Sonos sound systems. An indoor spa has a small Hammam, Jacuzzi, plunge pool and dual shower. Adjoining, a complete home gym delivers a top-of-the-range Technogym. There’s even an indoor fire pit. The stone-arched porch has an open fireplace and seating, and the walled flowering garden offers outdoor dining and a wood-burning grill. There is an outdoor, enclosed tennis court. The indoor pool and hot tub are perfect for cold-weather stays, while the outdoor 22-metre infinity pool is heated to 27º C for outdoor recreation. Grassy lawns bloom with wildflowers in season. Book a massage under a garden tree in summertime! Bedroom 1: First master suite. Tropics-inspired vibe with Bose sound system, airy linens, king-size canopy bed, and integrated free-standing bath. En-suite shower room with twin basins and tropical-style dual showers. Magnificent views of the gardens, sea and bay. Double-height vaulted ceiling with whitewashed beams. Bedroom 2: The second master and largest bedroom, overlooks living areas below. King-size bed with studded headboard and linen drapes, sitting area, and panoramic views to Santander. Integrated modern bathroom with free-standing bathtub, double rain shower, and twin basins. Bedroom 3: Quirky split-level children’s room decorated with toys to entertain. Steps lead to the mezzanine sleeping area with 8 futon-mattresses – a sleepover to end all sleepovers! Views to the rear garden and hills. The en-suite, Spanish-style bathroom has a claw-foot bath, marble basin and antique floor tiles. Bedroom 4: Ground-floor bedroom accessed through a Narnia-inspired “secret wardrobe” entrance. Beautiful Chinese design adorned with hand-painted wallpaper, gold four-poster bed, and Asian dressing table. En-suite bathroom with a Moroccan hamman-style bath-shower. French door leads out to views of the prairie and flowering gardens. Bedroom 5: One-bedroom, ground-floor annexe located off the main house entrance, with Spanish antique floor tiles, a romantic bedroom with king-size canopy bed, small shower room with vanity, complete kitchen and a small work area with desk and Wifi. Perfect for the Nanny or Chef. Bedroom 6: Located in the self-contained stone guest house a short walk downhill (grassy access by foot, or separate driveway by car) from the main house, offers a ground-floor king-size bedroom with incredible views to the hills. There is a separate bathroom with hammam-style bath and overhead shower. Bedroom 7: Ground-floor bedroom ideal for adults or children, with a 150cm bed and separate hammam-style bathroom with a ‘cocooned’ bath/shower that kids will love. Some bedrooms have space for a cot or foldaway bed for a child, please ask us for details. As if the serenely beautiful setting – green rolling hills sweeping down to cliff tops and sandy beaches – is not enough, the interiors of Villa Bahia are like walking straight into a photo shoot for Homes and Gardens Magazine! It’s as if the interior designer has taken a lifetime of inspiration from travels all over the globe and recreated it all in one perfectly presented property – that also happens to be an exceptionally welcoming family home. Heaven! Villa Bahia is a truly outstanding property with a team of staff on hand, where no detail has been spared. With its unique lofty interiors and hidden health spa, dream kitchen, private bodega and incredible landscapes, the personal attention to detail and service makes this a worthy addition to our Platinum Collection. Having an additional guest house plus a self-contained annexe, Villa Bahia is like a slice of heaven for large families travelling with friends and grandparents! Kids will adore the loft bedroom laid out with numerous cosy mattresses, while the heated outdoor pool, indoor pool and hot tub mean they can enjoy a splash around at any time of year – if they still have some energy after running around those countryside meadows and lakes! The setting of Villa Bahia is the perfect tonic to sooth your soul, surrounded by rolling green hills and sea-view panoramas. The private spa includes a heated pool, hot tub, steam room and fully equipped gym, while outside there is a full size tennis court, space for yoga and hillside walks around the estate, or you can even have a skipper take the Owner’s boat out for a brisk spin around the bay. Local chefs can create a menu of delicious healthy foods and freshly caught seafood that will leave you feeling a million dollars! From paddle surf classes to world-class sailing, gourmet meals with impressive views to rustic tapas bars down narrow cobbled streets, local craft producers and the major designer labels, and the beaches and the beautiful mountains right in front of the bay. Villa Bahia, near Santander in Cantabria, is within easy reach of a whole range of amazing experiences to add to your travel narrative. From world-class golf, epic surfing and exhilarating sailing, and the best of gourmet delights – set against the backdrop of one of the most beautiful bays in the world, we interact seamlessly with the best local suppliers to help make your stay extra special. Explore the cities and countryside of Northern Spain with a personal guide from our expert partners. Enjoy a selection of day tours or bespoke itineraries all with a door to door service in air-conditioned vehicles. And our top tip for a first-time stay in Cantabria is the escorted wine and tapas tour in Puertochico, Santander, where you can get to learn about the city’s history and its secrets through a walking tour of its bars and restaurants. Shopping in downtown Santander is always a pleasure – and whether it’s the freshest seafood at the food market for a BBQ or something new for a night out, our private guides will ensure you are taken directly to the exclusive boutiques and specialist shops, that aren’t so easy to find, as well as the high street for a bargain or two. You’ll also get to see the many charming squares including Cañadío, Pombo, La Porticada and Plaza del Cuadro – each perfect for a late breakfast or a few coffees or a glass of wine with olives or anchovies. Santander is buzzing with world-class museums, excellent cafes, tapas bars and casual and formal restaurants but you will find than even nearby in Ribamontan al Monte, there’s plenty on offer. Take for example the two-Michelin star El Cenador de Amos which is just 10 minutes from the Villa. And there are three more Michelin star restaurants (Solana, El Nuevo Molino, El Serbal) within a 30-minute drive. For more formal and informal options, you have great choice in the coastal towns of Somo, Loredo, Noja and Isla, with many inland options too. When it comes to city hotspots, Santander’s Cañadío restaurant and El Riojano offer lots of local who’s who – with charming meals also to be had at Deluz near the Sardinero and VORS on Castelar. If you’d rather visit some of Cantabria’s typical villages, we recommend medieval Santillana which was a favourite of Sartre, the regal town of Comillas that houses one of the few of Gaudi’s creations to be found outside Catalonia, the town of Lierganes which turns out great churros and craft beer and a Roman bridge, or the port town of San Vicente de la Barquera with its two-star restaurant Annua and the stunning views of the Picos de Europa. Perhaps you’d like to play a round of golf on Seve Ballesteros’ home patch in Pedreña? If you’ve been tempted to explore Northern Spain for ages but worry that Barcelona and San Sebastian are overrun with visitors, Cantabria is a place where you’ll find lots of tasty Spanish food, plus Spanish charm, culture and character. And miles and miles of beaches, traditional villages, bustling shops and breathtaking scenery, making it an ideal holiday destination for families and groups of friends alike. You can read more about Things to do in Santander and enjoying a day out in San Sebastian on our blog.